How Do I Utilize the Checklist Provided? 1- Required Equipment Checklist According to Boat Size: Consult this checklist to determine the size of your boat. Once you have established the size of your boat, the chart indicates the equipment required by law for that size. 2- “My Vessel” Checklist: Once you have confirmed your boat size and equipment requirements according to the list, you can now use the column under “My Vessel.” Check off required equipment on board your boat to make sure it is all there for your safety. Do you need a proper checklist in hand? You can download and print one at the bottom of this page! Better to be safe, than sorry. Weather and water are unpredictable elements, even for the most advanced boater. Preparation is the key solution. Equip yourself. Boat Size Matters. Let the checklists be your guide. Use the inspection checklist on board your boat before your next adventure to make sure it is all there! It’s the Law. Different states have different laws. Be aware that specific requirements by law that can differ by state. Abide by the laws & rules guide. The best boating adventures are hassle free. Make your next trip safe by consulting the checklists! 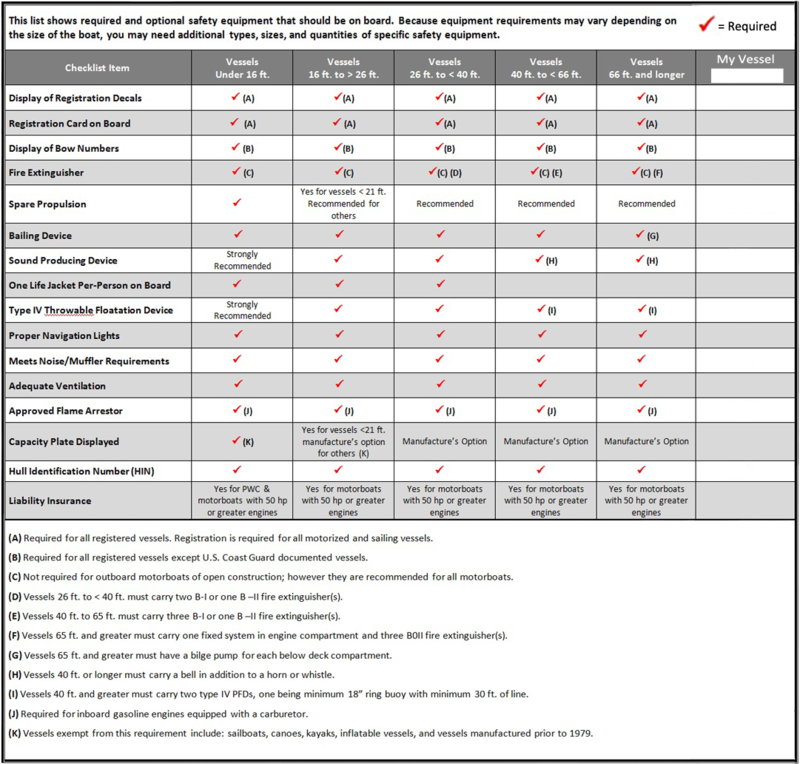 Download the Required Equipment Checklist!